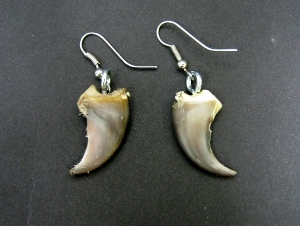 These are real claw earrings made from either a black bear claw or a coyote claw. The claw on the simple Black Bear Claw earrings measure 3.5 to 4 cm long on the outside curve, with a base of approximately 1.5 cm wide. A pair weighs about 6 grams. 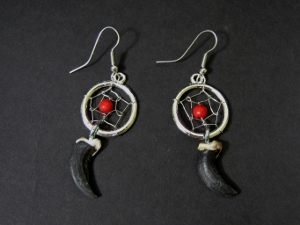 The Coyote Claw Dreamcatcher earrings have a tiny metal dreamcatcher charm measuring 2 cm in diameter, and claw pendants measuring approximately 2 to 3 cm long on the outside curve, and a base of 0.5 to 1 cm wide. A pair weighs about 9 grams.